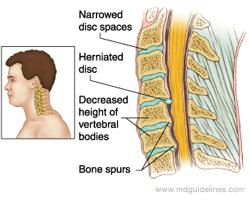 What is Intervertebral Disc Degeneration/Degenerative Disc Disease? Intervertebral discs sit between each vertebra (bone segments of the spine) and are comprised of fibrous cartilage. They act to stabilize and mobilize the spine, and also to absorb shock that results from movement, in order to prevent damage to the body. When intervertebral discs are damaged and degenerate (most commonly in the regions of the neck and lower back), the spine loses stability and mobility, and several complications can arise, including osteoarthritis (vertebrae start to rub together), herniation (discs bulge out and may compress nerves), and spinal stenosis (the spinal canal, where the spinal cord travels, gets smaller and may also compress nerves). Symptoms experienced with these complications may include pain, numbness, tingling, and disordered movement and can be severely debilitating. Intervertebral disc degeneration may occur as a result of several processes, including inflammation and decreases in available oxygen, water and sugar chains (a main component of intervertebral discs). Intervertebral disc degeneration occurs more commonly as people age, and is more likely to develop in those who are obese, smoke cigarettes, who frequently perform heavy manual labor, or who experience trauma from a fall. Given that the spine is the body’s main frame of support, maintaining spinal health is vital to leading a long and active life. The results of a controlled animal study published in PLoS One in December 2014 suggest that administration of cannabidiol (CBD), a non-psychoactive cannabinoid (known for its numerous potential health benefits including inflammation and pain reduction), may be useful in reducing damage caused by intervertebral disc degeneration. Researchers studied 19 rats and created a model of human intervertebral disc degeneration by using needle punctures to injure intervertebral discs of the tailbone area of the rats’ spines. The subjects were then split into three groups, and each immediately treated with a different concentration of CBD (30, 60, or 120 nmol). The discs were then examined using MRI (magnetic resonance imaging) and histologically (under a microscope, in order to see the injuries in finer detail). MRI analysis showed that treatment with 30 and 60 nmol of CBD did not result in improvements in injury. However, the group that had been administered 120 nmol of CBD did experience reduced damage. By MRI, improvements were noted within 2 days of injury/treatment, and they endured until at least day 15 post-injury/treatment (the last day of the experiment) when examined by MRI and histologically.